1978 GL1000 Resto-mod - NGWClub®, Inc.
A few of weeks ago, I acquired my second 1978 GL1000 project bike. I (foolishly) sold my original GL1000 project several years ago before ever getting it running, so now I'm looking to redeem myself, lol. It looks to be largely original and in reasonably good shape. The previous owner bought it roughly a year ago, intended to remove the Vetter fairing and fix the inoperative front brakes. In the intervening year, the battery died; it's now 100% inop. The original headlight bucket was missing, as were the original turn signals, but he had already acquired replacements. 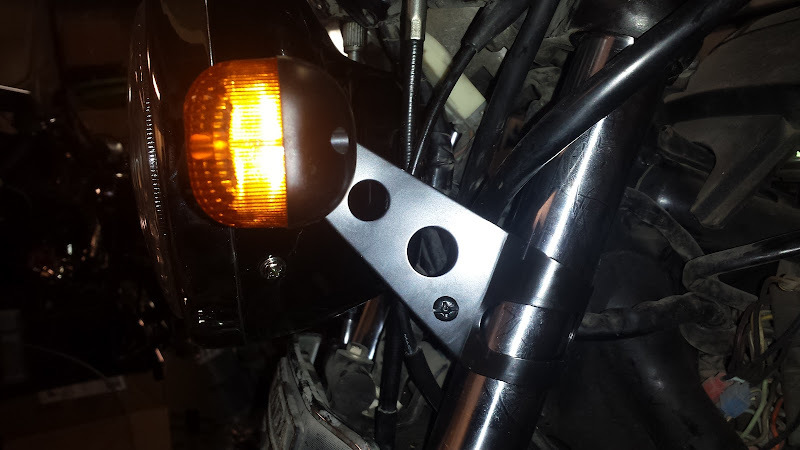 I'm not crazy about the replacement turn signals, but they'll do for now (they are rectangular, black plastic units that look nothing like the OEM blinkers on the rear of the bike. 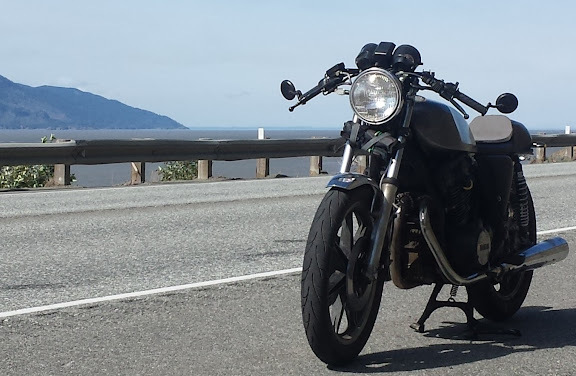 I like the lines of the stock bike, and one thing I've learned during the build of my XS750 cafe racer is that it is very important to get the bike running before sinking a lot of money into cosmetic upgrades. Often times, you will find that a design decision that looked good on paper isn't so good in the real world, so spend enough time getting a feel for the bike -- and fixing the real show-stopper maintenance items -- before sinking a lot of time, effort and money into items that would be nice, but aren't strictly necessary. Therefore, phase 1 of this project is minimal changes, just to get the bike operational. Take care of typical maintenance items (fluids, timing belts, etc. 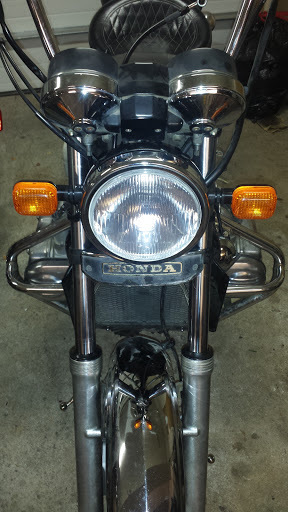 ), then complete the Vetter removal and install the new headlight bucket and turn signals. Replace the battery. After that, suspension upgrades to make the bike more comfortable for 2-up travel. I'm happy with the Progressive Suspension fork springs and Hagon 2810 TTSA shocks on my cafe racer, so I'll most likely use them on the 'Wing, too (in fact, I've already got the fork springs). Sounds like a fun project. Feel free to post a ton of pictures. Looking forward to it. I'm going to be picking up a 78 soon myself. Plan on building it for my wife. Good luck. Last edited by TNTbefree on Sat Dec 12, 2015 6:50 pm, edited 1 time in total. Yeah, that's a crack running the full length of the brake cylinder. There's a replacement in the mail from an E-Bay seller...I hope that one is rebuildable. On the plus side, I removed the old battery and temporarily plugged in the old one from my V-Strom after completing the oil change to see if I could get the bike to start...or at least turn over. To my great relief, the engine actually started and ran so I at least know that I didn't just buy an expensive piece of artwork. mwallette wrote: To my great relief, the engine actually started and ran so I at least know that I didn't just buy an expensive piece of artwork. So I think I may have figured out why the battery was inop when I bought the 'Wing...is it a bad thing to read 16.7V at 2000 RPM? Guess I'll be buying a battery AND a new voltage regulator for the bike! After waiting several days for brake pads, brake line fittings, etc. to arrive, I finally was able to hook up the new, braided stainless steel brake lines that the previous owner had bought. The brake line is about one, maybe one and a half inches too short! 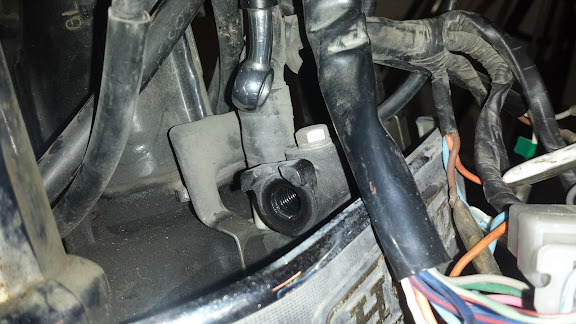 Since this is the brake line from the master cylinder to the splitter, I'll make the handlebars a priority, which should lower the master cylinder enough to make the brake line reach the splitter. On an unrelated note, I also received all the parts I need to rebuild the front forks, and install the Progressive Suspension springs. w00t! I opened up the forks to install new seals and Progressive Suspension springs, just like I did on my Yamaha. Getting all of the seals out was...fun ...but I got there. I installed the new seals, new springs, etc., then tried to figure out how much of the Honda 10w fork oil to add. I've got a 16 oz. bottle. Progressive says don't fill more than 140mm from the top of the collapsed fork without having installed the springs, but the manual gives capacities only (roughly 6 oz. ), so I set my fork oil measuring tool to 180mm...and ran out of oil before topping off the second fork. I'm close, but does it *REALLY* take more than 8 oz. of oil for a complete refill?!?! I had oil left over from the 16 oz. bottle of Yamalube on my XS750 (although it does have slightly smaller fork tubes -- 36mm, IIRC, as opposed to 37 on the GL1000. I guess I can always fill it how I think I should, and adjust later, but advice would be appreciated! Edit: fixed a couple of typos and grammar mistakes. I had typed the post above on my cell phone, lol. Last edited by mwallette on Sat Dec 12, 2015 6:31 pm, edited 1 time in total. If I remember correctly, the gl1000 only takes 7.2 ounces per side. Thanks! I thought north of 8 oz. seemed a little high. I finished up the fork rebuild the other night, then, not having enough common sense to quit, I stayed up until 4:00 a.m. (even though I had an obligation at 8:30, lol) reinstalling the freshly rebuilt brake calipers, the new Dime City Cycles fork ears (for mounting the headlight bucket), the new headlight and the temporary turn signals. I'm not really happy with the turn signals, since they don't match the OEM turn signals on the rear of the bike, but I've got my eye on a set at Dime City Cycles. That's a cosmetic fix, however, so it's a lower priority. Unfortunately, that pretty much catches me up with all the work I can do until I get more parts. However, there was one easy, low-priority item on my to-do list that I could knock out tonight. On my bike, the shelters on the faux tank are only held in place by the thumb wheels inside the storage compartment; the hinge pins are completely missing. I drove to Lowe's a few days ago to see if they had any hinge pins in 1/4" diameter (what I measured with my calipers) and 2 3/4" long (IIRC). They didn't, but they did have a length of 1/4" steel rod. Hmmm...if I cut the steel rod to the right length with my angle grinder, then VEEEERRRRYYYY carefully drill out a hole at each end with my drill press and a vise, I should be able to fabricate a good-enough hinge pin relatively easily. My first attempt ALMOST worked. I cut the hinge pin properly, but put too much pressure on the drill bit, causing it to deflect off to the side, carving a semi-circle in the edge of the hinge pin instead of a neat hole through the center of the pin. Fortunately, the pin was long enough for me to cut off the bad end and try again, and this time: success. I fabricated three more hinge pins the same way, then reinstalled the shelters on the 'Wing. Any machinist worth the name would roll his eyes at my hinge pins. They are simple and crude, but they work and cost less than the shipping for a Honda hinge pin on E-Bay, so I'm happy with them. mine are only held by the "thumb nobs" since 78, as I have a vetter fairing and it allows me to pull them off, and the fairing would not allow them to open. Randakk has replacements. Also, back in the day with vetter fairings, some people used a steel knitting needle slide through both back to front. When you wanted to get in, you pulled back the needle and undid the nobs. Ahhh...that explains it, then. 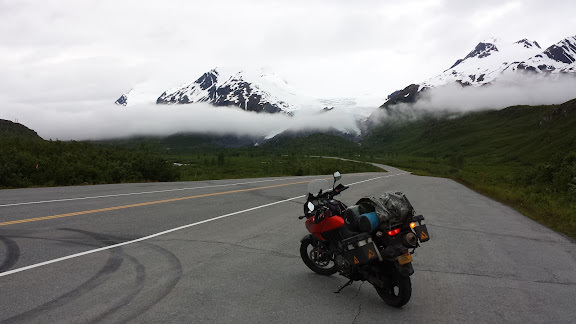 My bike had the Vetter fairing too, until the previous owner started removing it (thus the aftermarket headlight bucket and turn signals). It still had the Vetter mounting bracket installed when I bought the bike. Quick question for the forum technical gurus: what is the correct way to measure the rear shock length? I'm starting the search for replacements, and want to make sure I get the right length. On a forum search, I've found 13 inches eye-to eye, just a hair over 13 inches, 13 1/2 inches, so I figured I could just go measure what's already on the bike...but since the length will vary as weight is applied (that's kind of the point...), is that length with the shock installed, or removed from the bike? If installed, then is it measured with the rear wheel raised on the center stand, or not?